It seems that ISO certification is not foolproof. Photo BTWT. Today’s edition of Puls Biznesu breaks the story that PKP SA Chairman, Jakub Karnowski, has ordered the PKP main board to request Poland’s Anti Corruption Bureau (CBA) to investigate the manner in which 27 million PLN worth of contracts for ISO certification were awarded by 10 different PKP companies to Qwantum. The certification was part of the safety drive ordered by Minister Nowak following the Szczekociny rail crash in March 2012 in which 16 people died and 58 were admitted to hospital. An internal audit revealed that the work should have only cost 550,000 PLN. Qwantum, like the Minister, hails from the Gdansk-Gdynia-Sopot Trójmiasto on the Baltic coast. Meanwhile, in an apparently unrelated story, Wprost carries the story that opposition politicians are demanding that the Minister appears before the Sejm Infrastructure Committee to explain recent press articles about how he accepted expensive entertainment from Cam Media without making the appropriate declaration. The Minister has also acquired a collection of expensive VIP watches we he claims were only ‘swapped’ with businessmen. Cam Media is the company that came up with the ‘Feel Like At Home’ campaign for Euro 2012. It has received ‘tens of millions’ PLN worth of government contracts and also has worked on campaigns for the ruling Civic Platform party (PO). 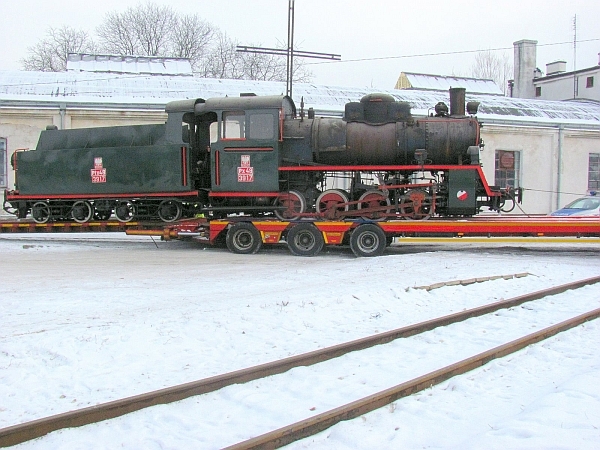 Does Poland have the last steam-hauled passenger service? Japanese designed 2-8-2 working a steam hauled passenger train in Kujang, South Pyongan province, North Korea. Video by newslabmedia. It seems that the Wolsztyn steam kettles which are due to be taken off their regular Wolsztyn-Poznan passenger service by 2017 may not be hauling the world’s last regular steam-hauled passenger service running on the national railway network! The site of the new bridge on April 18 2013. Video BTWT. Lodz is investing heavily in new roads in anticipation of many more motor vehicles coming into town when the new A1 motorway is completed. If the same pattern is repeated in Lodz as has happened elsewhere the new roads will persuade even more people to abandon public transport and take to their cars adding yet another twist to the spiral: new roads –> more cars –> more road congestion and air pollution. The Gorna area of Lodz. Map OpenStreetMap. 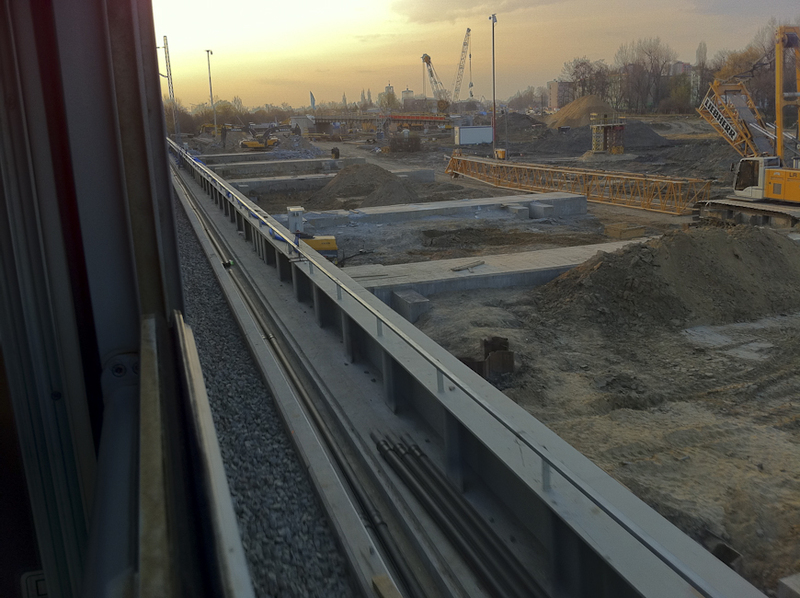 One of the roads being built is the missing piece of the southern end of Lodz’s inner by-pass, between al. Jana Pawła II and ul. Szeroka, straightening out a kink at the point where the (1) trunk road reaches the city’s road grid. This communist-era project was postponed for many years because of the cost of constructing a long railway viaduct so that the new road could dive under the railway line at an acute angle. Approaching the new bridge on 26 April. Photo BTWT. While several new roads at the southern end of the city will tempt motorists and HGV drivers to take the al. Wlokniarzy inner by-pass, the road building budget did not stretch to putting in corresponding improvements at the northern end of the city where the inner by-pass stops near Helenowek, a heavily built up area. Residents here already suffer from appalling congestion all along the (1) road to Zgierz. Sadly the ‘Lodz Regional Tramway’, which was supposed to run all the way to Zgierz and could have helpd to cut motor traffic, stops at Helenowek as well. Next to the bridge, the temporary bases are being demolished. The biggest civil engineering work on the new road was the construction of a 141 m long steel viaduct to take the existing railway line across the new road. 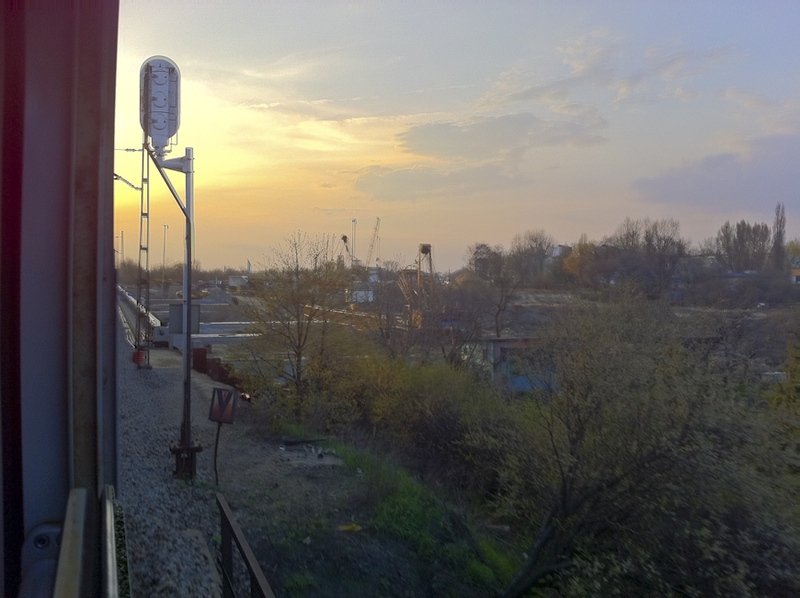 During the last eight months trains crept past the construction site while the abutments for the new bridge were constructed under the operational railway track. In addition temporary concrete supports were built to the north of the railway track and the new bridge – which had arrived as a kit of parts – was welded together on these supports. When the bridge was ready, the track bed was ballasted and railway track laid. Then during a 68 hour possession from Friday 19 April to Sunday 21 April the old railway track was dismantled and sufficient earthworks removed to enable the new bridge to be slid into place. Technical inspections were held on the Sunday evening and trains began running again on Monday 22 April. Heavy concrete breaking tractors. All photos BTWT. On Saturday afternoon, the Mayor of Lodz, Hanna Zdanowska called a press conference at the building site to enable the media to photograph the new bridge being slid into place. Given the importance of the event Wojciech Pater, the chairman of Mosty Lodz was leaving nothing to chance and arranged for his men to start the move at 07:00 hrs on Saturday morning. When all was ready the hydraulic rams were pressurised, one failed, but the others were more than sufficient to keep the bridge moving. 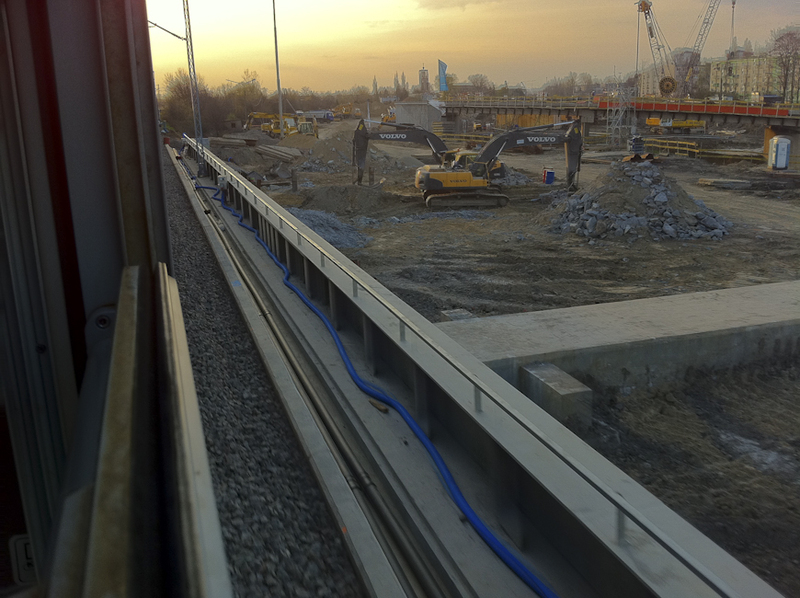 When you have 7,000 tons of bridge, ballast and railway track moving in the right direction you do not stop for anyone, not even the Mayor of Lodz. Four hours later the move was finished. So it happened that when the mayor, her followers and the press gathered to photograph the historic event, the new bridge was already sitting proudly in place. It had been positioned to an accuracy of ± 0.2mm, whereas the design tolerance allowed for ± 10.0mm. One hopes that after the appropriate hydraulic fluids were dispensed the media displayed the same degree of tolerance as well. Dziennik Łódzki – Wiadukt nad Trasą Górna przesunęli dwa razy szybciej! The photos and video were filmed on an iPhone 4; the video was edited and rendered using Final Cut Pro 7 running on an ancient quad core G5 Power Mac. The two minutes of film took 4 hours to render! The music used for the video is from the track How Long has the Train Been Gone on the Album To Forget An Actor by the London-based band Tranquilizers. If you liked what you hear, why not buy the track or even the whole album from here!